In the last few years, the region has expanded one port of entry, opened a cross-border airport hub and a new transit center and expanded highway infrastructure near the border. A new port of entry is in the works. Here’s a rundown of the upgrades that have come online, and what we can expect to see in the near future. The federal government and local agencies have been investing millions of dollars in recent years in border infrastructure to facilitate the flow of goods and people across the U.S.-Mexico border. Since 2015, the region has seen an expansion of one port of entry, a new cross-border airport facility, additional highway infrastructure to access border crossings and a new transit hub to make it easier for people in San Diego to get to and from the border. By 2023, we can expect to see the expansion of two ports of entry, a new bus route from downtown to the border and a new, state-of-the-art port of entry east of the two existing ones. The seeds for many of these projects were planted more than 10 years ago, and came together in a pilot Border Master Plan report in 2008 that discussed the big-picture planning needs of the California-Baja California border. Only a year earlier, the San Diego Regional Association of Governments estimated that delays at the border between San Diego County and Baja California cost the United States $7.2 billion in gross output and more than 62,000 jobs. “That is a monetary loss equivalent to 18 Super Bowls and an annual job loss equivalent to four companies the size of Google,” former SANDAG Executive Director Gary Gallegos told a subcommittee of the House Committee on Transportation & Infrastructure in May 2016. In San Diego County, there’s the San Ysidro Land Port of Entry – the busiest land border crossing in the Western Hemisphere – as well as the Otay Mesa Port of Entry, the second busiest commercial gateway along the U.S.-Mexico border. 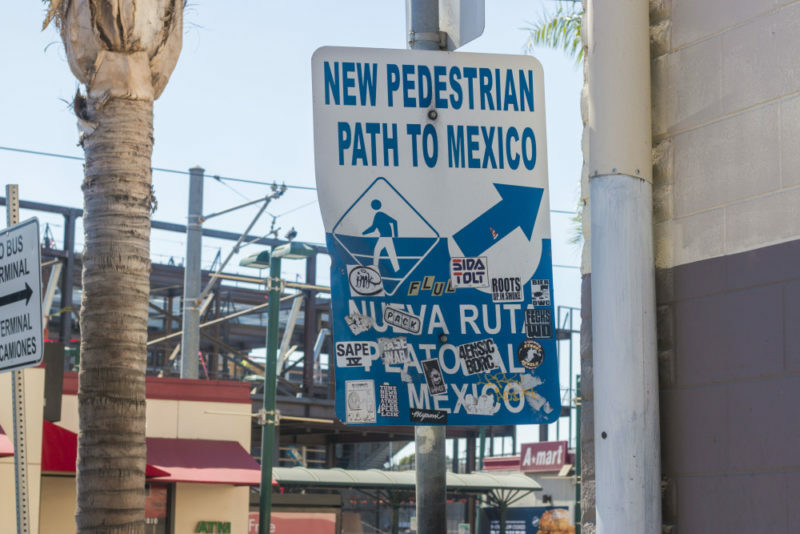 Initial concepts for another port of entry, Otay Mesa East, began among regional transportation planners of Caltrans, SANDAG and the state of Baja California more than 10 years ago. Those regional entities continue to lead the project. That will bring the number of legally designated places to cross from San Diego County to Mexico by land to five. And the improvements aren’t just additional ports of entry and lanes, said Caltrans Trade Corridor Director Mario Orso. The region has also been investing in technology and programs to make crossings more efficient, like joint cargo inspections with Mexico and better ways to track wait times. Orso said officials have also been putting air monitors at the border to better measure the air pollution from idling cars, and they’ve been in talks with Google Maps and Waze to work on ways to prevent people from accidentally crossing into Mexico when they’re driving near the border. “There’s many exciting pieces of it,” Orso said of the work being done on border infrastructure. Here is a rundown of the expansions, upgrades and new border infrastructure that has come online in the past few years and what we can expect to see in the near future. A new port of entry, a few miles east of the existing Otay Mesa Port of Entry, has been in the works for more than a decade. Tijuana’s residential and industrial development has steadily grown away from its downtown “Centro” and eastward over the past 20 years. That growth, plus the ever-increasing truck traffic through the western Otay Mesa Port of Entry, drove regional planners to float a new port of entry. Orso estimates the cost of the project is $900 million, with about $700 million coming from the U.S. side. The 2008 Otay Mesa East Toll Facility Act named SANDAG as the tolling authority, charged with raising the funds for the project through bonds. 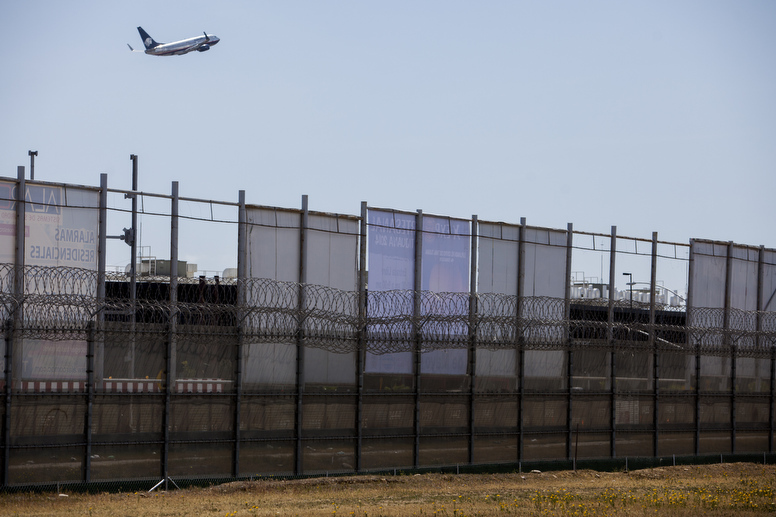 Once paid off, the facilities will be turned over to the U.S. and Mexican federal governments. The project was also awarded funds from Senate Bill 1, which passed last year, Orso said. He expects to finish a new traffic and revenue study next year. The toll at Otay East will be pegged to user demand at the Otay Mesa and San Ysidro ports of entry. The longer the waits at the other ports, the higher the toll at Otay East. A 2014 SANDAG traffic and revenue study of the project estimated a median toll of $2.35 for passenger vehicles and $15.45 for commercial vehicles. The tolls are key to financing both the port of entry as well as the roads to access it. And securing the tolls will require far better measurements of wait times. Right now, the U.S. Customs and Border Protection Border Wait Times app gives estimates of car and pedestrian wait times by officers’ line of sight – meaning that CBP officers look out and estimate times based on the number of people and vehicles they see, which isn’t terribly accurate. Planners are testing better ways to measure wait times at the San Ysidro Port of Entry, Orso said. 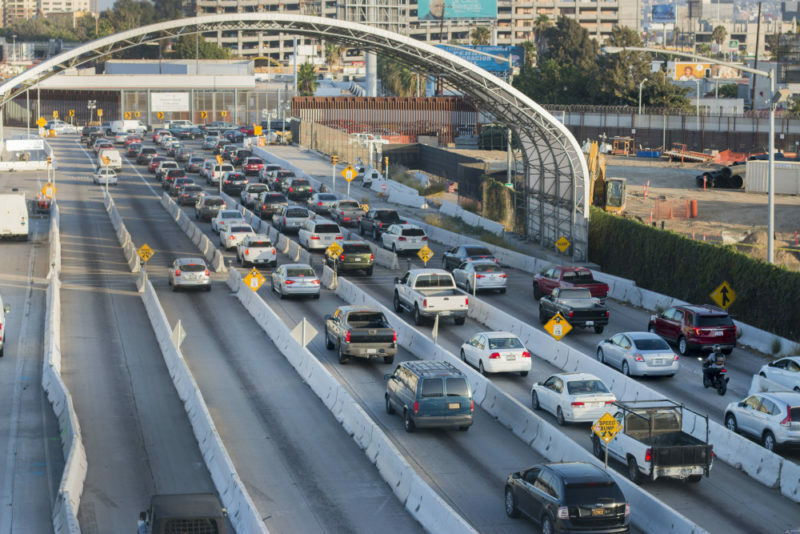 CalTrans’ QuickMap application now provides border wait times southbound going from San Ysidro to Tijuana. Orso said the agency is working with Mexico to start measuring northbound times in the same way. Eventually, CalTrans and CBP will be sharing the data. The new port of entry will have other innovations, like flexible lanes, which would be converted from commercial or truck lanes to passenger vehicle lanes depending on where demand is highest. For the past few years, a lot of the work on the new port of entry has been on the roads and right of ways accessing the area. Next year, Orso said, they should begin construction on the another portion of State Route 11, a toll road that will connect to the crossing with access to State Route 905 and State Route 125. He said he hopes the port of entry will be done by around 2022-2023. The San Ysidro Port of Entry has been undergoing a $741 million expansion and modernization overseen by the General Services Administration. The project is in the midst of the second of three phases. The entire upgrade is expected to be completed in 2019. You may recall some of the more frustrating parts of the construction, like when the border was closed for two days last September. The most recent update was the PedEast Pedestrian Processing Facility, which opened last month. PedEast added an additional 22 pedestrian lanes to the San Ysidro Port of Entry, though only 10 northbound lanes have been opened so far due to staffing, the Union-Tribune reported. Phase 1 was PedWest, a 22,000-square foot facility at the western side at the San Ysidro Port of Entry. It added 14 pedestrian lanes – 12 northbound and two reversible – that opened in July 2016. The adjacent Virginia Avenue Transit Center also opened to provide access to MTS buses and designated pick-up areas for taxis and private vehicles near the new facility. The transit center cost about $8 million and was jointly funded by GSA, the Federal Highway Administration and Caltrans. The final segment of Phase 2 includes the renovation of the historic customs house and construction of four southbound pedestrian processing lanes, a pedestrian plaza and a dedicated bus lane. Phase 3 will include the expansion and realignment of the I-5 South freeway, which will include 10 lanes with southbound primary and secondary inspection facilities. This phase will also include eight northbound vehicle processing lanes with 15 primary inspection booths, an employee parking structure and an administration building. GSA said the rest of the port’s upgrades should be finished in 2019. A modernization and expansion project is slated to begin at the Otay Mesa Port of Entry this year. GSA estimates the cost of the project to be $122 million. The upgrade will double the number of pedestrian processing facilities from six to 12 lanes, and will include the construction of a new commercial-annex building and an increase from nine to 15 commercial import lots. At the end of last year, a program for joint cargo inspections by U.S. and Mexican officials for commercial products entering the United States launched at the Otay Mesa Port of Entry to increase efficiency. A new Otay Mesa Transit Center will also be coming online early next year. This transit center will provide border-crossers access to the 26-mile South Bay Rapid bus route that will run between the Otay Mesa Port of Entry and downtown San Diego via a dedicated transit guideway along East Palomar Street and Eastlake Parkway in Chula Vista. In December 2015, a $120 million facility with a pedestrian bridge, located about midway between the San Ysidro and Otay Mesa ports of entry connecting San Diego to the Tijuana International Airport, opened. Passengers with airplane tickets from the Tijuana airport can park or be dropped off at the facility in Otay Mesa and pay a small fee to cross (pro-tip: if you buy your tickets to cross CBX online, you’ll save a few dollars). The idea was first put forth in the 1990s, the Los Angeles Times reported when the facility opened. Decades later, the project was built privately by Otay Tijuana Venture, made up of several Mexican and U.S. investors, including Chicago real estate mogul Sam Zell, the Times reported. In 2016, the facility’s first full year of operation, 1.3 million people used the pedestrian bridge. Every year since, that number has grown, the Union-Tribune reported at the end of last year.